Gabby Cantorna, when asked how many injuries she’s had in her rugby career, has to pause. She can’t come up with an exact number. One of the most severe injuries resulted in a raised clavicle, because she separated two joints and the unstable ligaments made it difficult to breathe. As hard as it was for her, she missed significant time and could only sit around her house for a couple months. Cantorna’s semi-frequent injuries, however, have not held back her career. 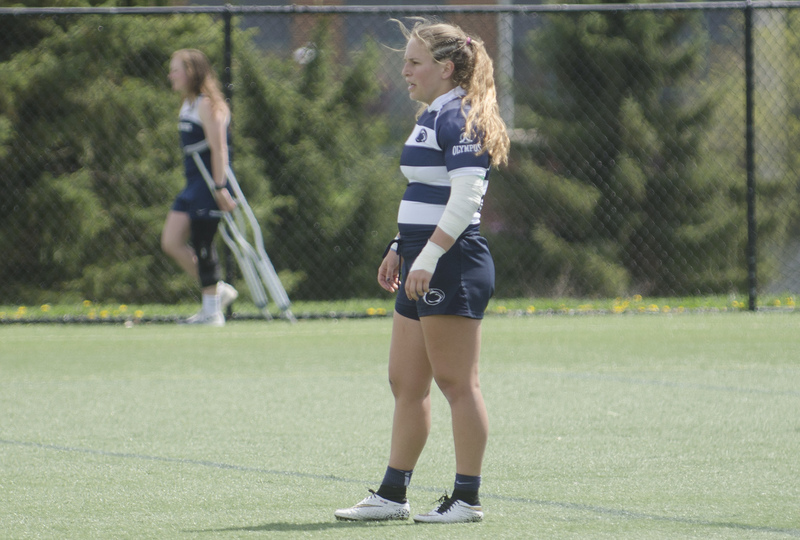 Cantorna is the reigning Big Ten women’s rugby player of the year. Not only is she an essential piece to the dominant Penn State team, but she has also played with a handful of national teams and is ranked as one of the best players at her position in the United States for her age group. That level of competition seems natural to Cantorna. And there is no drop-off when it comes to success. After all, Penn State has won 11 national championships, with the team vying for another this year. That expectation of success doesn’t get to Cantorna. And yet, even with the target on their back every time they take the field, the Lions still manage to win at a stunning rate. In the current season, which began in February, Penn State finished the regular season at 13-3. It is not the amount of wins that the team has amassed that are impressive, but rather the manner in which it does so. The Lions scored 203 points in the first two games of the season against Pittsburgh and Keele University. Their opponents? Both failed to score even once. In all but one of their 16 regular season games, the Lions held their opponents to 12 or fewer points. Penn State, meanwhile, surpassed 50 points eight separate times. Although she is not a captain this semester, Cantorna was voted as one in the fall. Still though, she is no less vocal on the field and does her part to set teammates up for success on every play. With a combination of speed and power, Cantorna moves fluidly through the field pushing through opposing tackles and flipping the ball to her teammates at the last possible moment before they break off, rumbling home for a score. And when she gets tackled, she’s the first one back up, cheering the team on. And those 30-some injuries that she’s sustained? They haven’t deterred Cantorna from the sport that’s taught her so much and allowed her so many incredible opportunities. Just how good is Cantorna? Her coach, Kate Daley, said she believes that there is no one else in the collegiate game that sees the field as well. If rugby were a game of chess, the most successful chess players have the ability to think a handful of moves ahead and execute a plan to win. That's precisely what Cantorna — who Daley describes as "tactically intelligent" — does for the Lions every time she steps on the field. Garrett is the editor in chief of the Daily Collegian student newspaper. He helped cover the 2016 Paralympic Games in Rio de Janeiro for the Associated Press through the John Curley Center for Sports Journalism. Garrett spent the summer of 2016 interning on the sports copy desk at The New York Times. He was born in Indianapolis, but grew up in Kentucky.